Rio's Favelas Feel The Peace — And The Pressure — Of Pacification : Parallels Before hosting the World Cup, Brazil launched a program to pacify high-crime slums. The project has cut violence in some areas, but in others residents have been caught in the police crossfire. Protesters hold a sign Saturday that reads, in Portuguese, "Don't kill our children," in a march against police and gang conflicts that have left residents of the Complexo de Alemao favela in the crossfire. 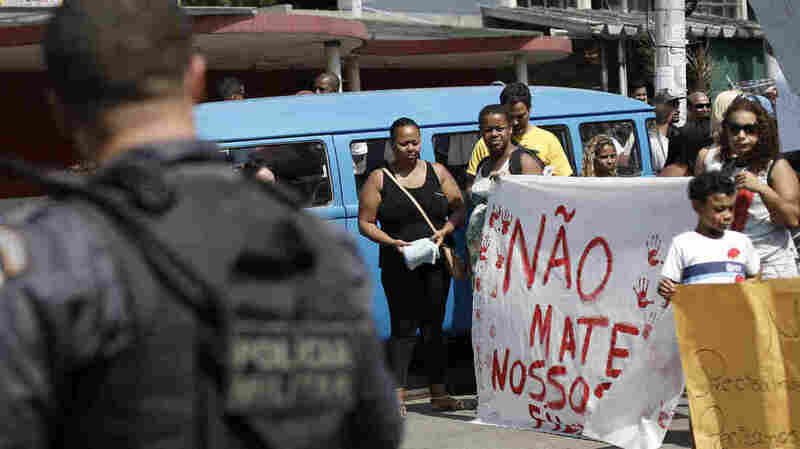 On a Saturday morning, in a group of Rio de Janeiro's notoriously violent shanty towns, or favelas, heavily armed pacification police stand on one side of the street, on the other side, protestors call for them to withdraw. On the protest side, Mayse Freitas lists the people she knows who have been injured or killed in shootouts in the area recently. "I'm a mother and a grandmother," Freitas says. "I don't want my children or grandchildren to be next." Six years ago, the police moved into Rio's notorious favelas in a pacification project aimed to reduce violence in the city's worst neighborhoods, violence that was daily and brazen. The government was hoping to reduce crime ahead of the Olympics next summer. But in Freitas' group of favelas, called Complexo de Alemao, pacification has been a failure, she says. "There is no pacification here," she says. "What we have is a war. Criminals against police, fighting over who are the more powerful the more influential. And who suffers? We do." In some of the larger favela complexes, where armed traffickers are more entrenched, police pacification units, known as UPPs, have been much more heavy-handed. In Alemao, shootings in which residents are caught in the crossfire are common. Police have been discovered trying to plant weapons on innocent bystanders. There have even been cases of forced disappearances and torture. Traffickers have also attacked and surrounded pacification police outposts, and many cops have been injured and some killed. But the pacified favela of Vidigal feels completely different: relaxed and quiet. Visitors are ferried up to the top of the community by motorcycle to take ocean-view snaps or stay at guesthouses. "Here it is peaceful," says resident Carlos Pedroso. "I go to other pacified favelas, and it is also much better than before." Vidigal and a clutch of other favelas that are doing well are close to the tourism areas of Leblon and Copacabana. They are also smaller, and in many cases, pacification was followed by investment in infrastructure and social welfare spending. "They are not a single experience," says Ignacio Cano, an expert on pacification with Rio de Janeiro's State University. "The situation varies a lot from some communities to others. Anything good or bad which has happened in the last five, six years in terms of public security in Rio has systematically been attributed to the UPPs." But the data, he says, show that the situation is much more complicated. Since pacification began in 2008, UPPs are now in 38 communities encompassing 264 separate favelas — only a quarter of the total number of favelas in Rio. Cano says between the program's start and 2012, Rio saw a steep decline in homicides and robberies all over the city. Inside favelas with UPPS, homicide rates were actually halved. He says before pacification, there was no state presence in most of these informal communities. "They have given us an alternative paradigm for public security," he says. "After the UPPs, even though the results are mixed, I think there is a clear perception that there is another way to deal with insecurity." But there are still many problems. Recently, crime is again on the rise. There had been a hope that this type of community policing would change the extremely violent police culture in Rio, but that hasn't happened. "The relationship between the police and the communities are still very tense and very bad in many UPP communities," Cano says. "Most policemen don't want to work in the UPPs, so the degree of internal legitimacy is very low." Still, analysts say pacification has been a net positive for the city, and simply ending the program would be disastrous. So far, the promise is that the program will continue through at least 2018, beyond next summer's Olympic Games in Rio. But a massive economic crisis currently grips Brazil. "The state has already cut its budget by over 25 percent when it comes to public security," says Robert Muggah, a specialist with the IGARAPE Institute, which studies public security in Rio. "There is a big question mark looming over all of this, which is whether the Brazilian government can sustain financing for these kinds of innovative models." UPP commander Lt. Carlos Viega in Vidigal says the pacification program is already feeling the pinch. "It's important to have a budget to meet our needs" he says. "We can try to be more efficient. But we need more money, as sometimes we feel we are kind of alone out here."